On the way to Gaziantep we stopped at this fruit stand to buy some grapes. Before even checking in at our hotel we stopped at the Gaziantep Mosaic Museum. MÜZE is one of the largest collections of mosaics in the world. They also had some sculptures, columns, and other artifacts. They also featured people in the mosaics. In the museum they also explain how archaeologists are able to preserve and move these frescoes and mosaics. The saddest part is how many of these mosaics have been destroyed or stolen by treasure hunters and thieves. This is the famous Gypsy Girl, although she wasn't really a gypsy. The castle in Gaziantep was closed for renovation. This guard spoke to us in pretty good English, but in general very few Turks speak English or German. Here's a door mat of Gypsy Girl, the same picture we saw in the original mosaic. Gaziantep has so many interesting shops. They make most of these wood and metal items locally. Many of the craftsman work outside of their shops. Silver, copper and gold are all for sale in the bazaar. We went to the Emine Göğüş Cuisine Museum. Here's a model of a family eating at the cuisine museum. Gaziantep is a foodie's paradise. Dried eggplants, chiles, okra, to be soaked in water and used in cooking. I'm crazy for all the fresh fruit, especially the apricots and cherries. I even got to try mulberries. These beautiful groups of buildings from the Seljuks of Anatolia (1077-1307) are called hans or caravansarais. This han will be renovated over the next year or two, with shops on the ground floor and apartments up above. This collection of antiques for sale includes early laptops and "antique" cell phones. Suddenly we saw a ton of media and photographers, then these "suits" and diplomats came walking down the street. The Turkish people are so friendly and in general, they don't mind being photographed. The gas line must be under here. I love how Che Guevara is an international hero. Gaziantep has a very nice bazaar. Phyllis and her niece Michelle. Phyllis is retiring from teaching English in Turkey, so she organized this trip for the 4 of us. 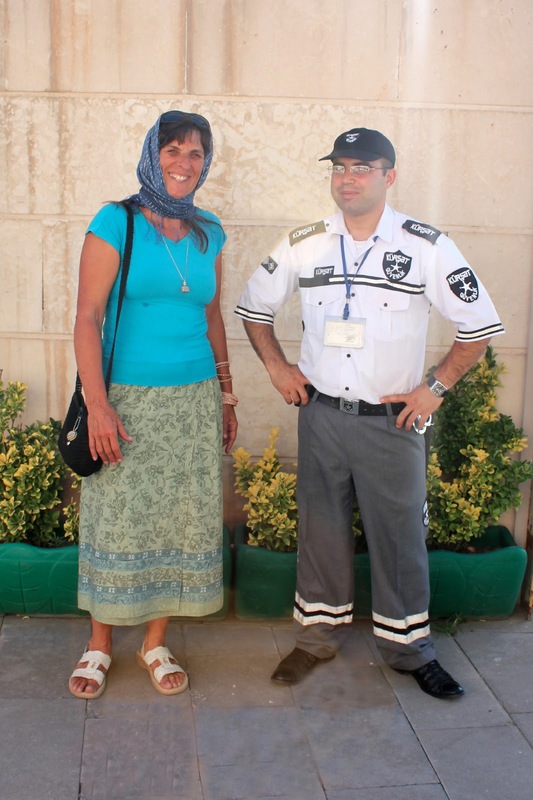 Gwenn has been living in the Middle East for 20 years. She's just finishing a book about the street girls of Cairo. A vender in the bazaar. The Turkish flag features the moon and star. Beautiful hand-painted pottery like what we saw in Avanos. The bazaars are a labyrinth of shops. This family looked so nice, I had to take a picture. Yıl Atatürk Kültür Parkı (100th Anniversay Atatürk Culture Park) is the largest park in Gaziantep located in the center of the city along the Alleben river which it borders for 5 km. Romantic young couples were enjoying the park in the early evening. A mosque at night. The call to prayer is 5x a day. We're in the beginning of Ramadan, where the people fast during the day for a month.